Of one thing that we may be very certain, and indeed grateful, is that Harrison Weir was very much a man of both BOOKS and LETTERS. During his lifetime he collected and maintained a large library, like many Victorians, actively pursuing knowledge of past practices with regard to his many interests, but especially those involving types of animals, poultry, birds, insects and all matters pertaining to horticulture. Even into his most senior years he engaged booksellers to look for specific books of which he had knowledge and wished to obtain. He was fortunate in sharing this love of books with his brother John Jenner Weir, and what interesting conversations the two must have had, comparing their thoughts and ideas on a whole range of subjects about which, they both had become intimately acquainted. Jenner’s interest in, and fame as an entomologist ,dovetailed beautifully with Harrison’s interest and knowledge in horticulture. They were both breeders of pigeons and many different varieties of cage-birds. There was not a major ‘cage-bird show’ or ‘poultry show’ and later ‘cat show’, at which either one, or both did not officiate as Judges. 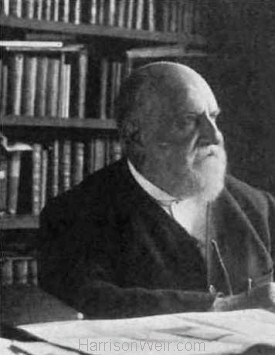 In the photo of Harrison Weir that appears in both Frances Simpson’s “Book of the Cat”(1903), and in Charles Lane’s “Dogs and Doggy People”(1902), Harrison is seated at the desk of his office/library, behind him, a full array of books he had either collected, written, or illustrated. This of course, is likely to have included all the editions of the many books by authors, in which his artwork was either the ‘featured content’ or which enhanced the compelling anecdotes. If we include all the Children’s books, Journals and Annuals, and all the Periodicals in which his drawings would have appeared, we would I am sure, be able to create a very large and impressive library of our own. When historical biographers review the lives of a particular subject, the first port of call is either or both, books and letters. We seek the work of other biographers, review the historical evidence in periodicals, look for references to our subject in the biographies and reminiscences of contemporaries, and for physical evidence of autograph letters or letters from the subject that have been quoted from before. All this to gain a more complete picture of the character and personality of the subject of the biography, and to help us to understand both their thinking and their attitudes, as well as the influences that were brought to bear on them during their lifetime. Fortunately Harrison Weir, like many Victorian gentlemen of his era, was a avid letter writer, as were his famous and not so famous contemporaries, folk such as Charles Darwin, William Bernhardt Tegetmeier, Lady Dorothy Nevill, Charles Dickens to mention but a few, and a host of other well-known artists, authors, socialites and naturalists. To this end, when we started our collection, we made a concerted effort to obtain copies of ,and to procure as many original autograph letters under his hand, as we possibly could. We were fortunate that at the time, there were a number of such letters available. These now form the core of our collection. In this very short essay about books and letters, we provide just a brief glimpse into a few examples of books and letters that formed a minor role in his daily life and the stories behind them. Our first story dates from 1851 and relates to a book which in all likelihood, was in the library in the above photo, when that photo was taken at the turn of the 19th and 20th century. It is the copy of John Milton’s “Paradise Lost”, illustrated by John Martin, printed for Henry Washbourne, London in 1850, that was once the personal property of Harrison Weir. The book was an exhibit at the Great Exhibition of 1851, which is where Harrison Weir came into possession of it. Harrison Weir, like most artists and those friends who were likewise allied to the printing trades, were all present at the Great Exhibition of 1851. George Baxter, under whom he had once worked as an apprentice engraver and printer, had a large stall there, and had for some years been considered the leader in the field of colour printing, holding as he did, a patent for his process of printing in oils. But he was not alone in exhibiting examples of colour printing at the Great Exhibition, in the newly constructed Crystal Palace. His main opposition, came from another estranged former apprentice, in the form of George Cargill Leighton, who along with this brother had formed Leighton Brothers, and who were likewise specialising in colour printing, but focused in the main, on the book trade. Harrison Weir, who was by now clearly allied to Leighton Brothers, had, along with a group of other artists, produced a number of works that had been printed in colour by Leighton Brothers, in a book entitled “The Village Queen”. This work, among many others, was also an exhibit at the Crystal Palace. So bearing in mind that printers and booksellers were in plentiful supply, the exhibition was a virtual treasure trove for anyone seeking to obtain a classic, newly published and crafted book, a fine example of the bookmakers art, the books requiring the combined skills and input of writers, artists, engravers, printers, book-binders and leather tooling craftsmen. It is therefore little wonder then, that Harrison Weir, who knew the illustrator John Martin personally, and who himself came from a background as an experienced artist, engraver and printer, would so much admire the sheer dedication and craftsmanship required by all involved, to produce a book of this exceptional quality. And as a book collector, he would have jumped at the chance to obtain a copy for himself. And we are glad that he did, and more-so, that he not only preserved it, but had the foresight to leave the personal note attached to the inside flyleaf, for without it, this little story may never have been told. Our grateful thanks to David Brass for allowing us to include both this story and the photographs, on our site dedicated to Harrison Weir. Our second story also dates from 1851. The full title of this book is: “Tales from Catland…written for little kittens by and old tabby, Tabitha Grimalkin”. As to when it was originally written, or who by, I have not been able as yet to ascertain. But the pseudonym of “Grimalkin” itself refers to what was, by Victorian times, an accepted “generic” term to describe a cat, in much the same way as “Dobbin” was a generic term applied to, or referring to ‘a horse.’ The earliest use of the term in the English language appears to date from William Baldwin’s “Beware the Cat”, published in 1570, when the name Grimalkin was generally associated with cats and the devil, and witchcraft. There are a number of variations in style and spelling, including Grimmalkin, Grimolochin, and Grymalkin. The book has been published in various formats and illustrated by a number of different artists. This particular anecdote refers specifically to a version published by Griffith & Farran, dated 1851,and containing four line illustrations by Harrison Weir. Our interest in this particular publication was two-fold. Primarily we wished to gain an original copy that contained relatively good images of Harrison’s work, suitable as reference material for the preservation of those same images. The other, was to specifically record all feline imagery created by the “Father of the Cat Fancy” and to seek out the earliest such images that we possibly could. We were aware of other early images of cats and kittens by Weir that dated from this time, including those associated with the ‘Treasury of Pleasure Books for Young Children’ published by Joseph Cundall, which included images of ‘the cat that chased the mouse’ in the story of ‘The House that Jack Built’, and another of ‘The Cat and the Mouse’ (which lost its tail!). Also dating from this same period, the images of cats by Weir that appeared in ‘Domestic Pets, their habits and Management” by Mrs Jane Loudon, published in 1851. But good , relatively clean copies of “Tales in Catland” are difficult to obtain, and most, even if obtainable, are generally not first editions, but 2nd, 3rd or even 7th editions. And most of those that we have seen, are lightly or heavily foxed and certainly not in pristine condition. We have one 2nd edition copy in our own archives dating from 1853, but we were pleasantly surprised to find the copy shown here, which is a first edition version, and is in overall excellent condition, but which is special for other reasons. Firstly, unlike the normal editions, which contain just line drawings, in this one, Weir’s drawings are beautifully hand-coloured. This may be due to the fact, that the intended purchaser was Queen Victoria, who planned to gift the book to her dresser, Skirrete. From our point of view, it was significant for us to both know, and be able to show, that the Queen would have been aware of Harrison Weir as an illustrator. That seems to be highly likely, given that he had been granted permission to visit the Royal Aviaries and Poultry houses as early as 1845, but more-so, because his illustrations had for a number of years, begun to appear more regularly in The Illustrated London News and the Pictorial Times. These appear to date from around 1846-1847 forward, some of course, featuring livestock which had been bred or owned by members of the Royal Family. But this is the first instance we know of, where a Children’s book illustrated by him, has passed directly through royal hands to another party. In this particular case, Her Majesty has personally inscribed the book for her the recipient, and we are fortunate to be able to show you this in the attached photographs, thanks to the courtesy of Heritage Auctions.